This article has new content coming soon from Black Armory and may not be complete, confirmed, or correct. Please update it as soon as any relevant and accurate material is available. Editors must cite sources for all contributions to this article. Edits that do not follow this standard will be reverted without notice. For more information, see the Citation Policy. "Listen long enough and you will hear stories of great Eliksni heroes. When the Great Machine was still with us." The Fallen, known in their own language as the Eliksni, are an insectoid alien species that fights against the remnants of humanity, as well as the other races vying for control of the Solar System. Notorious scavengers and raiders, the Fallen seek to reclaim their glory by retaking control of the Traveler at any cost. "The stories say the Fallen were once a proud people. Great, in their own way. We've only known them as pirates and butchers." The Fallen are a nomadic race of pirates and scavengers descended from a once-great civilization. This is evidenced by their social organization into various Houses by the manner of meritocratic nobility, the banners and flags of which are still flown like heraldry. The Fallen search the stars for artifacts of their lost civilization. They first arrived in the Solar System after the Collapse, arriving in their massive Ketches to loot and pillage humanity's former worlds, leaving grief and wreckage in their wake. The Fallen are antagonistic toward the Cabal, Taken, Hive, and Vex, and are known to be in conflict with the latter two over territory and technology. They have ordinarily avoided the Cabal until the Taken War, when the House of Wolves attempted to make their new home on Mars using abandoned Cabal bases. They lack any type of established stronghold such as the Citadel or the Hellmouth, instead preferring to squat in ruins or inside their ketches, going from place to place in search of a potential home. A new faction of Fallen, the House of Dusk, became active during the events of Destiny 2. A year after the Red War, Uldren Sov led a faction of reanimated Fallen pirates against the Reef, known as the Scorn. A Fallen crime syndicate under the control of The Spider operated within the Tangled Shore, and forged a working alliance with the Guardians and Awoken to end the Scorn threat. Likewise, an anarchist syndicate called the Kell's Scourge attempt to plunder Golden Age weaponry across the EDZ and on Nessus. "Where is the Great Machine? Where is the Great Machine?" — Chelchis, Kell of Stone. The Fallen's name for their own race is "Eliksni". They were once graced by the Traveler, which they named the "Great Machine", and were presumably uplifted by its gifts in the same manner as humanity. Their ubiquitous cloaking technology was originally designed as toys for children. The Eliksni made during their Golden Age twice the advancement in space exploration than Humanity. During this time, they came to control multiple star systems until a event known as the Edge Wars brought infighting among the Houses and later ended by the House of Kings and House of Judgement to usher a Golden Age. Their homeworld and civilization would be destroyed by a unforeseen event called the "Whirlwind". In the aftermath, the surviving Fallen became embroiled in a bloody civil war over their civilization's ruins, before achieving a tenuous peace and embarking on a journey into space to locate the Traveler in order to return to greatness. The Fallen eventually arrived at the Solar System shortly after humanity's Collapse, and rediscovered the Traveler on Earth. "Remember the hope that brought us here. Remember the age before the Whirlwind, when ether ran free, when we ruled ourselves and our futures as kings. We wanted more than glimmer and glints and herealways. Always remember that we came to this star in hope. And remember that we were denied!" — Skolas, Kell of Kells. When the Fallen first arrived in the Sol System, they terrorized humanity, conducting raids and attacks against outposts. Very early into these attacks, they started to meet opposition in the form of Guardians, who fought back against them time and time again. The Fallen grew to resent the Guardians, seeing them as an obstacle that prevented them from claiming the "Great Machine", and believed they were dooming them and their people. Eventually, the space below the Traveler turned into The City, as more and more people gathered below the Traveler, and thus walls were built to defend them. As time wore on, the Fallen began to understand that if they wanted to take back what was theirs, they would need to do it with force. This was the start of the Eliksni siege. "Let them have the Great Machine. They deserve it." In an attempt to take the Traveler, the House of Devils staged a coordinated attacked on The City in a battle that would later be called Six Fronts. During the battle four orders of Titans protected the newly constructed walls of The City against six enemy approaches, and not a single front faltered. The Devils faced off against many Guardians who would later become legends, such as Saint-14, Osiris, Zavala and the Iron Lords. Craask, Kell of Kings, manipulating the other Houses, pushed for a united effort against The City. Kings, Devils and Winter stood together against The City, with the House of Wolves being the only major House unable to join because of The Reef stopping them en route. The three Houses fought against The City and its Guardians in what would later be known as the Battle of Twilight Gap, with the Devils leading the charge. The City managed to push back the united Fallen, with Lord Shaxx leading a counter attack that defeated the Houses. At the end of the war, the legendary Titan Saint-14 led a bloody assault to dislodge the remaining Fallen that directly surrounded the City. In what would become forever known as a the "Crusade of Saint-14", the brave Exo fought against Solkis, Devil Kell, killing him with a headbutt and bringing the Fallen offensive to its final end. While on a mission, Andal was murdered by the renegade Fallen mercenary Taniks, the Scarred. This promoted Cayde-6 to assume the role of Hunter Vanguard. "I am Lord of Wolves. You are an empty thing with two dead souls. This is my House. These are my terms. Surrender and I will only take your ships." — Virixas, Kell of Wolves to Queen Mara Sov. 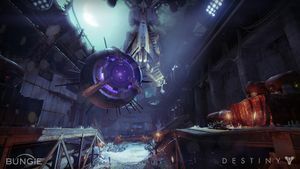 The House of Wolves intended to join the Battle of Twilight Gap alongside the other houses, but were stopped at Ceres when the Reef intervened. Their Kell, Virixas was killed in the initial clash, along with a massive portion of the house, which would later be called The Scatter. This started a period of time known as The Reef Wars. During the course of the wars, Skolas, the Rabid rose to the Wolf Kellship. He then turned his full attention towards The Reef, and the two forces clashed for many years. 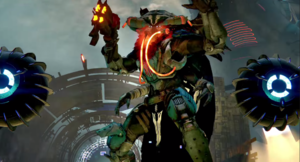 The wars ended when Variks, a member of the House of Judgment who lived among the Wolves, betrayed Skolas to the Reef resulting in his capture along with most of his House. Variks went on to crown Queen Mara Sov of The Reef as the new Kell of Wolves, with many Wolves bending the knee to her. In the wake of Twilight Gap, the House of Devils was ruled by Riksis, Devil Archon. Riksis met a sudden and unexpected end at the hands of a newly risen Guardian, while attempting to track down a missing warp drive. With the Devils Archon dead, this opened up the way for a fireteam of Guardians to attack the The Devils' Lair and destroy their Prime Servitor Sepiks Prime. With Sepiks' destruction, the Devils were now effectively leaderless. During a mission in the Hellmouth on The Moon, Guardians were caught in the middle of a House of Exile raid against the Hive. Leading the raid was Frigoris, Exiled Baron, who became a priority target due to his station in the Exiles, and was dispatched by the Guardian. The Vanguard received word that Wintership Simiks-Fel was on the surface of Venus, and began a mission to assassinate Draksis, Winter Kell of the House of Winter. Fighting through Draksis' Kell's Guard, a Guardian made their way onto the Fallen Ketch and faced Draksis in his throne room, killing him and beheading Winter's Leadership. Afterward, perhaps as an attempt to replace Draksis, Winter enlisted Taniks, the Scarred to break into the Prison of Elders and retrieve Aksor, Archon Priest. However, a fireteam of Guardians quickly ended him and the Fallen which broke him out, leaving them leaderless. Later, the Hive general Omnigul would lead a fireteam of Guardians through House of Kings Territory in an attempt to stop them from hunting her. Phyksin, King Baron personally attempted to stop the Guardians, but was killed in the resulting battle. "Skolas said, "I am Kell of Kells. All Houses shall burn. All will bow before the Wolf banner." Initiated by the return of Skolas, now calling himself the Kell of Kells, the House of Wolves rebelled against the Awoken. The Wolf Rebellion started with an assassination attempt on The Queen and a mass prison break from the Prison of Elders where most the the former Wolf nobility was being held.The Queen opened the Reef to Guardians of the City, with the intent of recruiting them to put an end to the rebellion. The Guardians tracked Skolas to Venus, but were unable to capture Skolas and he was able to gain a number of the Winters allegiance. Traveling to Earth, Skolas sought to gain the allegiance of the House of Devils and House of Kings. While he set loose the Silent Fang to kill off the Devils remaining leaders, he sent one of his Barons, Yavek to negotiate with the Kell of Kings. However, the Guardians intervened as they killed a large number of Silent Fang assassins and killed Yavek and two King Barons, Paskin and Vekis. Skolas returned to Venus once more, where the Guardian encountered him attempting to wield stolen Vex tech in order to pull the House of Wolves through time, only to be subdued and captured. The Queen then began her Queen's Wrath by placing bounties on Wolf nobility such as Beltrik, the Veiled and Drevis, Wolf Baroness. Taniks, the Scarred was also hired by the Wolves to plunder the Hellmouth and steal from the dark. However a fireteam of Guardians arrived to kill him, pursuing the mercenary through his Ketch before meeting his end. 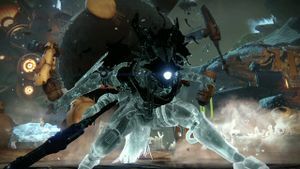 Later on the order of the Queen, Skolas was sent to the Prison of Elders, where he was pitted against the same Guardians who captured him and was executed, effectively ending the Wolf Rebellion. "Taken will not rest. Will claim every house. Consume every banner. You must stand, Guardian, yes? Or all shall fall." Every Fallen house was devastated by Oryx's arrival, with great numbers of Eliksni being Taken and made to serve Oryx. The House of Devils and House of Kings presence in the Cosmodrome diminished as their strongholds the Devil's Spire and King's Watch became liars for Shades of Oryx. Variks at some point was in negotiations with Grayris, Baroness to leave her house, however she would succumb to Oryx and become his Taken Champion alongside Lhoks, Exile Baron, Irxori, Lost to Oryx and Keksis, the Betrayed. 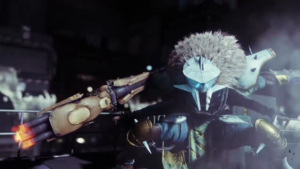 The Wolves also suffered a loss in the form of Driviks, the Chosen, which forced the Guardians to re-enter the Traitor's Ketch and eliminate the swarm of Taken. 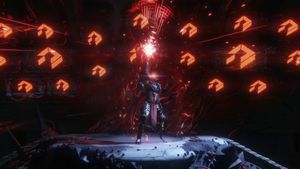 As the Taken War progressed, the House of Winter managed to take advantage of the Reef's disorganization to break into the Prison of Elders and retrieve another Archon Priest. However the Taken on Venus attacked and scattered their forces, Taking the Archon in the process, turning him into Nixis, Hunger of Oryx. Guardians managed to destroy Nixis, ending Winter's second raid on the Prison as easily as the first. Also during this time, the House of Devils attacked the Warmind Rasputin's bunker, attempting to take control of the Warmind and its weapons. Rasputin send out a distress signal, causing a fireteam of Guardians to come to the Warmind's aid. The Guardians followed the Devils inside, and fought against S.A.B.E.R.-2, a massive Shank re-purposed by "rising Devil Archons" to crack into Rasputin's core. S.A.B.E.R.-2 was destroyed, and the Devils were forced to retreat. "House Wolves tactics... bad tactics. Fight Cabal? (laughs) Could not find new Kell because there is no Kell. House Wolves follows a new god, a Servitor, a Prime. This is a pilgrimage, Guardian. And for faith, they will stop at nothing." The House of Wolves emerged from hiding, rallying under Keldar, an Archon that had escaped the Reef Wars and Skolas' Rebellion. Keldar offered the Wolves a new god to worship, the rebuilt Orbiks Prime, the Wolves' previous god. Orbiks Prime attempted to reassemble the House on Mars, directing its servants to seize Cabal outposts already weakened by the Taken invasion. However, thanks to intel provided by Variks, the Loyal, the Guardians hunted down Keldar and Orbiks, destroying the Prime Servitor and killing their Archon, leaving the Wolves broken and leaderless; this time, for good. "Long have we wandered in the blind prison of flesh. Those old lives now a memory, transposed by another. The gift brings pain, yes, but godhood must come at a price." 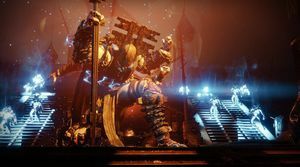 Under the leadership of a new Archon, Aksis, the House of Devils and their Splicer Sect attempts to find Golden Age technology bore fruit in the form of SIVA deep in a quarantined area of the Cosmodrome called The Plaguelands. 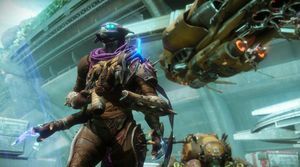 The Splicer sect used SIVA to modify themselves, transforming themselves into cybernetic beings, with Aksis becoming wholly a machine. The Devils attacked the Iron Temple, attempting to steal information about SIVA to further their understanding of it. They were stopped by a Guardian and Lord Saladin, the last Iron Lord. The Guardian ventured deep into Splicer territory to the SIVA replication chamber called Site 6, destroying the source of the SIVA and cutting off the Splicers from their SIVA supply. Afterwards, Sepiks Perfected, their former Prime revived with SIVA, was tracked back to its lair, and was hunted down by a fireteam of Guardians. Sepiks was cornered, and was destroyed once more. Another fireteam of Guardians was dispatched to stop a Splicer priest named Kovik who was experimenting on the Hive along with SIVA. The Guardians descended into his lair and killed Kovik, along with a Hive Ogre he was vivisecting. Afterward, another fireteam stopped a Splicer attempt to keep Kovik's experiments alive by invading the Hellmouth and capture more Ogres to experiment on. With the Splicers backed into a corner, a larger fireteam attacked the Splicers lair directly. There they encountered Vosik, the Archpriest, second in command of the Splicer sect. They hunted him deep into the wall the Splicers had dug into and destroyed him. 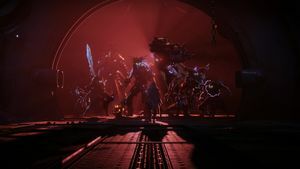 The guardians continued to explore the Splicer lair and discovered the Devils had found a facility similar to Site-6 as well as their leader, Aksis, the Archon Prime of the Devils, lurking inside. Prevailing against Aksis's terrible technological might and using SIVA against him, they managed to destroy Aksis. In desperation, the Devil Splicers proposed an alliance with Taniks' Crew and used SIVA to resurrect Taniks, the Scarred as Taniks Perfected. Unfortunately, their efforts were discovered by Variks, the Loyal who relayed their plans to the Vanguard. The Guardians led a Strike on the Moon against the Splicers, Taniks' crew and the Hive who were harassing them. Despite their efforts and Taniks' new abilities, they failed. With Taniks dead again, the Splicers were once again left broken and leaderless, thereby bringing an end to the SIVA Crisis. — Craask, Kell of Kings. 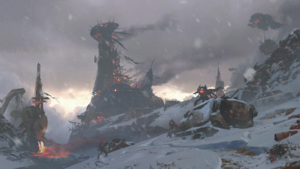 Eventually the Fallen House of Devils withdrew completely from the Cosmodrome, leaving behind piles of ceremonially burnt banners and armor. The other Fallen Houses—Winter, Exile, Wolves—appear to have done the same, withdrawing en masse everywhere and abandoning their former territories. Around this time, Prince Uldren Sov arranged a meeting with Kell of Kings in order to build a personal army of Fallen for his own purposes. "Skolas tried to unite the Fallen Houses but failed. Who would have thought that sheer desperation would succeed where he failed." After Dominus Ghaul occupied The Last City, a seemingly new faction of Fallen resurfaced within the Solar System, the House of Dusk. These Fallen sport hoods, purple robes and armor, along with new equipment not seen prior to their resurgence. From Ghost scans of artifacts and tactics, it appears that the House of Dusk is a merger of all the other Houses. Apparently, so many losses and the deaths of so many leaders forced the Fallen to unite out of sheer desperation. Even so, it is unknown who currently leads the House of Dusk as the identities of its Kell, Barons and Archons is also unknown. The emergent House of Dusk found themselves in a war with the invading Red Legion forces, later engaging in dogfights with Red Legion fleets in a dispute of the Shard of the Traveler. In addition, House of Dusk troops are battling a guerrilla war with the surviving Guardians in the European Dead Zone, battling for supplies, while also battling the Vex on Nessus. They also follow the Vanguard's surviving fleet to Titan, hoping to scavenge from the fleet and the lost Golden Age facilities on the moon. Upon arriving, however, not only are they forced to fight the Vanguard's forces but also a newly discovered Hive brood that has infested the New Pacific Arcology. A three-way battle began between the Guardians, Fallen, and Hive for control of the facilities. No Fallen communications have been detected from their old territories on the Moon, Mars, or Venus. Despite the Guardians being preoccupied with the Red Legion and liberating the Last City, they didn't turn a blind eye to the Fallen's activities. After defeating Ghaul and driving the Red Legion from the City, Guardian forces began missions that started disrupting Fallen operations that led to the deaths of numerous Servitors, Captains, Mining Crews, Fallen Walkers, valuable Ether supplies and even an Archon Priest. Even so, the Vanguard still don't know who truly leads this new House. "Kill a Fallen, I claim it as Scorn. Kill a Scorn, I raise ten more!" Capitalising on the lack of leadership in the post-Taken War Reef, a group of Dregs who collectively titled themselves the "Scorned Barons" banded together after they were cast out from the House of Exile. They waged a civil war against the Fallen Houses for practicing the old Eliksni ways and the terror they unleashed had grown as powerful as any Kell even having driven the House of Wolves to extinction through the destruction of all their Servitors by the hands of Reksis Vahn. They even successfully allied with a local Hive brood when Hiraks, the Mindbender took In Anânh, Brood Queen as his consort. A shortwhile after the Red War, Hunter Vanguard Cayde-6 gathered a small group of his most trusted Guardians and, with the assistance of acting-Regent-Commander Petra Venj, hunted down the Scorned Barons. At a final standoff, the Barons were defeated and those not killed were thrown deep within the Prison of Elders. Only one at the scene, their Archon, Fikrul, the Fanatic, managed to escape. At some point following the Taken War, Prince Uldren; who had been corrupted by Darkness and working with the House of Kings, discovered a mortally wounded Fikrul who was once a well-regarded Archon Priest of Kaliks Prime within the House of Wolves, but was cast out after speaking against the Great Machine and lamenting his species' dependence on Servitors for survival. Wishing to save him, Riven granted Uldren's wish and part of Uldren's Darkness transferred into Fikrul's Ether, raising him as the first of the Scorn. Both Fikrul and Uldren found each other as kindred spirits and usurped Craask, Kell of Kings and immediately took over the House of Kings. Fikrul then docked and demoted the former Kell to Dreg status before slaughtering the House in a grand betrayal as Uldren decided that the Kings were too bothersome for his ambitions. With the use of Dark Ether, Fikrul began to hammer the Fallen society and raised the deceased Kings as a new undead army named the Scorn. "The Great Machine stood in Judgment. Eliksni fell to fighting. Fell to hate.... And so I become Variks, the Kell. House Judgment envoy to the Eliksni people... Eliksni must rise… yes?" During the opening of the Red War, Variks watched from the Prison of Elders as the Red Legion cut a swath into the Solar System. He tried to send a warning to The Last City under the name of Greenraven but was unable to do so as the Red Legion knocked out the City's communication capabilities. He also sent a warning to the Fallen Houses, including the Kell of Kings, to convince them to help him unify and save what was left of the Eliksni. Variks watched in horror as his sensors showed the Traveler getting trapped within the Traveler Cage, and the Guardians fall. After the Red War, Variks was tasked with integrating a mysterious group of Fallen in the Prison of Elders. To his shock he learned that his former friend, Fikrul, was the leader of the so-called Scorn and was allegedly responsible for killing Craask, Kell of Kings. With the last of the Kells assumed dead, Varik's hope of a united Eliksni crumbled as he locked all of the Barons into cryopod cells. Variks asked his old friend about the whereabouts of Kaliks Prime, whom both made a pact to hide away, and asked Fikrul if he had betrayed the last Prime to the Taken and if that is the source of his corrupted ether. Fikrul replied that Kaliks had abandoned the Eliksni altogether. All the while Uldren attempted to test Varik's loyalty with his Kell, Queen Mara Sov. However Variks found himself thinking about the old House of Rain proverb of the Kell of Kells. After much thought, Variks decided that he would become the Kell of House Judgement so that he could unify his race. To do so, he figured that he would need to cause a prison riot so that he could abandon his service to the Awoken without being noticed. He prepared by running simulations on the prison security systems, making adjustments to them based on the simulation results and had a final talk with his High Servitor, deeming it the last Warden of the Prison. He then had a final talk with Fikrul and Uldren on the day of the prison break, informing Uldren that he had more service to do. The Mad Warden, acting as Variks, then sent a message through the speakers announcing a malfunction in the security system and had commenced a shutdown and reboot, which resulted in the all the prison cells and cryopods opening. As the cells opened, Variks made his way through the secret passage way that Petra and Cayde used to smuggle in Fikrul and Uldren into the Prison, and recorded two messages to be sent through the prison's relay. The first message he recorded was with his synth voice device turned off to talk in High Speak, to give commands to those Eliksni who would answer the call of House Judgement. The second message he recorded was spoken with his synth device about the the whispers he hears from all those around him of his insulting titles, and how he will become the Kell of the House of Judgement, an envoy for the Eliksni. He boarded a ship full of the prison's ether supply and was saluted by a Vandal bearing the colors of the House of Wolves . "Oh, of course the Prison of Elders was a collaboration between the Awoken and the Eliksni. Don't look so surprised."" A year after the Red War came to a close, the Guardian and Cayde-6 traveled to the Reef to investigate the unrest but were ambushed by Uldren and the leading seven Barons of the Scorn, along with their spiritual leader and Archon, Fikrul, the Fanatic. Cayde was then beaten, his Ghost destroyed and then killed by Uldren in cold blood. Outraged by the death of the Hunter Vanguard, The Guardians, acting upon their own accord and unsanctioned by the Vanguard, return to the Reef to start the hunt for the Scorn and the rogue Awoken prince to avenge Cayde-6. Upon the breakout of the Scorn, the House of Dusk also began to fight the Scorn, beginning a new civil war within the Eliksni race. A Fallen mob was sought out in the Tangled Shore by Petra Venj and the Guardian, where their leader, The Spider, agreed to work with The City and Awoken to destroy the Scorn once and for all. The Spider provides information and bounties on the Scorn for the Guardian in return for taking out the Scorn's leaders and operations, thus allowing the Fallen mob boss to reestablish control and influence over the Tangled Shore. Ultimately, Uldren plotted to find his sister, Mara Sov, using traces of both Light and Darkness to open a gateway within the Awoken Watchtower, with the Scorn aiding him. 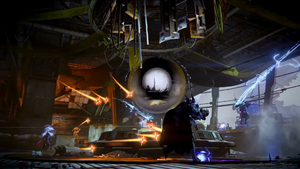 However, the Guardian began to disrupt the Scorn's operations in spreading chaos in the Reef. One-by-one, the Scorn Barons fell to the Guardian, leaving Fikrul and Uldren himself cornered at the Watchtower. The Guardian stormed the Watchtower which was corrupted with Taken forces, and battled with Fikrul. They succeed in defeating the Archon but upon delving deeper within the Watchtower, they find a monstrous creature that is revealed to be the one of the forces behind Uldren's actions, the Voice of Riven. The creature, disguised as Mara Sov, used him to gain its freedom and soon captures him. As it turns out Riven, the last known of the wish-granting Ahamkara, became Taken after Oryx invaded the Reef but upon his defeat, appeared to serve a new master and aspired to break free of the Dreaming City. Appearing as Mara Sov to corrupt Uldren's mind into opening the gateway, Riven has a chance to emerge and corrupt the material world. Fortunately, the Guardian arrives and battles with the twisted creature. After a long struggle and despite the creature's strange powers, the Guardian succeeds in destroying the Taken Chimera. The creatures destruction also frees Uldren but leaves him weak and defenseless in the face of the Guardian and Petra Venj. In the end, Uldren Sov, former disgraced prince of the Reef and murderer of Cayde-6, is executed, avenging Cayde's death and all those who perished during the Scorn's rampage in the Reef. While remnants of the weakened Scorn remain in the Tangled Shore, the Guardians continue their vigilance over the region, both to keep their bargain with the Spider and to make sure the Scorn no longer pose a threat again. Though the Scorn was nothing more than a pawn to Riven into opening the gateway within the Dreaming City, the Scorn remain active in their efforts in spreading chaos within the Reef. Over time, the Scorn's Archon, Fikrul, returns after his supposed death, swearing vengeance for the deaths of his fellow Scorn Barons. The Guardians track Fikrul back to the Scorn's lair and battle with the twisted Archon once again. Despite his Dark Ether powers, Fikrul was defeated once again but he swears that he will return to have his revenge. In addition to the Guardians campaigns, the Taken have also managed to deal more damage to the Fallen as they continue to corrupt the Dreaming City and spread the Taken curse. "Wolves rebel. Now, Wolves extinct. This where-live mine-things scatter must end. I will Kell the mind-open Eliksni. No spider-tricks. No loyal-lies. Variisis truths. We fight for Great Machine together." While the recent events took its toll on the Fallen, new leaders for their people have risen. Variks, the Loyal declared himself the Kell of Judgement after experiencing the tragic fall and hatred inflicted on his people, in the same way that Skolas declared himself Kell of Kells after the events of the Reef Wars. Variks, finding the Kell within himself, is now making stand for his dying race. All the while Mithrax, the Forsaken has defected from the House of Dusk and sworn allegiance to the Last City, eventually joining a fireteam of Guardians and founding the House of Light. He argues that humanity, not the Fallen, are deserving of the Traveler and promises to Kell the mind-open Eliksni. The Spider still continues to work with the City by placing bounties on high value targets. 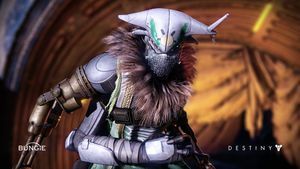 Upon discovering that Mara Sov is still alive Yevik, a former House of Wolves member now working with the House of Dusk, begins plotting a return to his former Wolf Kell; who he is still loyal to. With the demise of the House of Wolves, former members of the house can be seen working with the House of Dusk including the The Silent Fang, Queenbreakers, Pallas Siegebreakers and those affiliated with Beltrik and Irxis. Although the House of Kings suffered a major loss in the docking of their Kell, remnants of the Kings still reside by the European Dead Zone near the Shard of the Traveler. "His name is Siviks, and he is the leader of the Kell's Scourge syndicate, a group of anti-everything Fallen, hell-bent on sowing chaos wherever they go"
With the Fallen in disarray, a new leader in the name of Siviks, Lost to None emerged to lead a newly-formed anarchist organization, the Kell's Scourge. 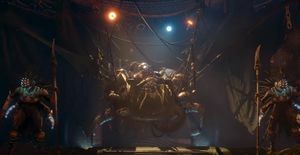 At some point before Black Armory, Siviks fell out with his brother, The Spider, and formed his own rival syndicate upon escaping incarceration at the Prison of Elders. In his crusade to spread chaos, Siviks and his crew stole technology from the Black Armory and distributed it to the Fallen across the system. This forces Ada-1 to ally with the Guardians to end Siviks' threat before they can use the tainted weaponry to do some serious damage. Fearless and growing fast, the Scourge gained the support of deserting House of Dusk members and made a push into the Spider's territory at the Tangled Shore, establishing themselves as his competition. After defeating several "anarchist" Fallen in the EDZ, a intercepted signal revealed Siviks's center of operations on Nessus. Siviks is found by The Conflux alongside Telksis the Pillager, but escapes and leaves Telksis alone to defend the Black Armory caches. Guardians are then tasked with eliminating Serekis-9, Kell's Scourge who is guarding the Gofannon Forge and then dispose of Zevious-3, Forge Warden. Seeking the Black Armory Vault after their failure to secure the forge, the Scourge carries out the biggest Fallen attack on the Last City since the Twilight Gap, utilizing a terrifying, enormous war machine named Insurrection Prime to breach the city and occupy a desolate section in the Scourge of the Past Raid. It is the most powerful Prime Servitor ever encountered, rivaling Aksis, Archon Prime in sheer power, and required a team of six to bring it down. After an immense battle between the Guardians and Insurrection Prime that reduces the area to ruin, the forces of the City succeed in destroying Siviks' army and Prime Servitor monstrosity, saving the Black Armory Vault from falling into the wrong hands. Siviks then met his end in a final standoff against the Guardian at Niobe Labs, marking the end of the Scourge's leadership. Following Siviks' death and the dismantlement of the Kell's Scourge, the Last City's agents have conducted thorough investigations regarding the remaining strength of the Fallen. Chiefly, the House of Dusk continues to weaken and in the absence of leadership, they continue to splinter and radicalize. However, agents have noticed that in the wake of the contemporary houses dwindling strength, a new recent trend of Fallen "syndicates" has begun to emerge. This is taken as a symbolic sign of the continuing eradication of the Fallen's old society. Likely an artifact of multi-generational colonization of human strongholds, the agents believe that because these syndicates have no relation to any indigenous Fallen culture, as young Fallen are appropriating and imitating human mythology in the absence of a strong cultural heritage of their own. In addition to the Houses's loss of status and power, several personalities have emerged as potential candidates as leaders. Other agents have begun investigations in regards to the whereabouts and motives of Variks (whose role in Uldren and the Scorn's release is now known). Despite once being a reliable ally and informant, the Last City's agents have discovered his part in the Scorn's early rampage and are aware that he is now styling himself as Kell of Kells, yet still representing the House of Judgement. Though some agents, like the Warlock Aurnor, have called for Variks's arrest, the Awoken under Petra's leadership claim jurisdiction and responsibility over the former scribe and thus have barred their attempts to apprehend Variks. Another individual agents have investigated is Mithrax, leader of the so-called "House of Light." Though the agents acknowledge that Mithrax has worked alongside the Guardians in the field on more than one occasion, authorities and agents both treat reports regarding Mithrax with a healthy degree of skepticism until otherwise confirmed. Regarding investigations into more aggressive figures among the remaining Fallen, Fikrul, the Fanatic, remains a threat. Though his reign over the Tangled Shore was limited, he possesses sufficient skill, hatred, and motive to warrant an on-going surveillance. Given Fikrul's propensity for self-resurrection, the Vanguard continues to deploy fireteams to suppress the Fanatic and have reached out to the Cryptarchy and the Gensym Scribes to request guidance as to find a way to make his destruction permanent. Another Fallen that has emerged and caught the agents' attention is Eramis, or Eramis, the Shipstealer. Once a House of Devils Baroness incarcerated during the Wolf Wars, Eramis successfully fled the Prison of Elders during the mass escape orchestrated by Variks. Eramis is a classical Fallen pirate of the old ways: vicious, uncompromising, and possessing cunning of the highest degree. Field reports indicate that she has begun rallying violent dissidents to reconstruct the House of Devils from scratch. As a result of this, many agents believes Eramis to be the most viable candidate for universal Fallen reunification, and urge the Vanguard and others to prioritize her destruction. "Judgment, true Judgment, required hierarchy. And Eliksni hierarchy died with the fall of the Houses." The Fallen, without their armor. The Fallen are a hardy species, and can survive in a wide range of environments without heavy armor or complex modifications to their physiology. Fallen have four arms, partable mandibles and typically wear a helmet with a built-in respiration apparatus. Respiration is assisted by spiracles. Through means either natural or artificial, the Fallen can regrow their arms if removed from their body. Their blood color is reddish purple. Fallen depend on a substance called Ether to survive, which only Servitors can produce. Servitors convert scavenged matter and energy, presented to them ritualistically by the Fallen, directly into ether via unknown processes. While Servitors were revered in ancient times, they have now become a symbol of the degradation of Fallen society and their lost glory. Higher-ranking Fallen get a bigger ration of ether, and more ether allows Fallen to grow in size; this is why Captains are taller than Vandals or Dregs, and why Kells and Archons tower over other Fallen; the Kell of a House controls and distributes ether flow using their own personal Cipher. When a Fallen is killed, a quantity of ether escapes its body and dissipates. The Scorn are very different physically from other Fallen, being "undead" Fallen resurrected many times through unknown means. Their exoskeletons bear bulbous masses, and many of them are of a sickly, pale coloration. They also are much more savage than the typical Fallen. "In a world without Kells, Dreg strength will breed nothing but chaos." In addition to Fallen glyphs, Bungie has released a number of images with examples of Fallen writing, including a number of unique letter combinations. Fallen society is divided into a number of Houses, none of which are known to maintain friendly relations with one another, save for the House of Judgment, which was meant to live among the other houses and keep the peace. Each House is ruled by a Kell, who acts as the political leader of a House and commands a Ketch. Prime Servitors are exalted as gods among the Fallen, inspiring fanatical devotion from the House to which they belong and providing a steady supply of vital ether and new lesser Servitors. Archons serve as both high priests and chief engineers of a House, mediating between the Kell and the Prime Servitor in addition to overseeing maintenance of the House's machines. Houses require all three to be fully stable; without a Kell a House becomes prone to infighting, without an Archon a House's Prime Servitor is vulnerable to attack, and without a Prime Servitor a House cannot produce new Servitors for ether. As such, Fallen do not take the loss of their leaders lightly. If any or all of these leaders were to be killed, then members of the House would panic and scatter, weakening the House to the point of being permanently broken. Below the upper echelon of House leadership are the Barons and Captains and the individual crews they command. Captains are Fallen who have managed to gather a following of Vandals and Dregs, who serve as the Captain's crew, commanding respect through brute force. Most Captains swear fealty to a certain House, but some operate independently. A step above Captains in rank are the Barons, whose authority are second only to the Kells so they command their own Skiffs as well as their crews. The majority of Fallen Houses consist of Vandals and Dregs. Vandals serve as both seasoned infantry and skilled workers. They aspire to become Captains and one day lead crews of their own. Dregs are the lowest class in Fallen society. Docked of their lower pair of arms in a ritual of humiliation and obedience, Dregs zealously fill the roles of shock troops and menial laborers in crews. The life expectancy of a Dreg is notoriously short, but those few who survive to be promoted to Vandals are permitted to regrow their arms. Kell—the political leaders of Fallen Houses. Prime Servitor— worshipped as machine gods that provide life sustaining Ether to the Houses. Archon—high priests and field commanders that complete the triumvirate leadership of a Fallen House. Baron—noble captains who lead their respective flotilla of Fallen Skiffs and Ketches. Have stronger shields and more health than regular Captains. "House Winter, attack. House Devils, plot. House Kings, plan. House Wolves, circle. House Judgement...wait." Dreg—the lowest rank of Fallen who seek to prove their worth. Armed with either a Shock Pistol (common), Shrapnel Launcher (rare), or Shock Daggers (common). Stalker—a class of Dregs that have been mysteriously reanimated by the Scorn's power. Wretch—a new rank of Fallen that appeared after their resurgence during the Red War. They are armed with Arc Spears. Spider's Associate—a class of Wretches that work alongside Guardian forces under the Spider's command. Vandal—most common troops of a Fallen crew and can fit in several roles. Armed with either a Shock Rifle (common), Wire Rifle (uncommon), Shock Blades (rare), or a Shrapnel Launcher (rare). Marauder—hooded Fallen with wrist-mounted blades, cloaks, and hoods, sporting gear similar to Guardian Hunters. They have the ability to cloak and are armed with either a Shrapnel Launcher (common) or Shock Blades (uncommon). Captain—commanders of a Fallen crew. Armed with either a Shrapnel Launcher (common), Shock Rifle (rare), Shock Blades (rare), or a Scorch Cannon (very rare). Equipped with an Arc Shield and can teleport. Shank—robotic drones that scout and patrol territory. Heavy Shank—heavily upgraded Shanks and a recent addition to the Fallen arsenal. Servitor—spherical machines that supply Fallen with ether. Have their own directed Void energy weapon and can teleport. Fallen Walker—spider-like assault tank used to guard key Fallen assets. Armed with a wide variety of weapons, including a main cannon that fires laser-guided explosive rounds at high velocity. Their mechanized vehicle units carry overtones of Japanese mecha, and their ships appear like rusted futuristic submarines. According to GameInformer, The Fallen cooperate with both Cabal and Vex forces, who are in fact enemies with one another as seen on Mars. This has yet to be shown in-game, as the Fallen House of Winter is at war with the Vex on Venus, and the House of Wolves later came into conflict with the Cabal. A T-shirt, featuring a Fallen Glyph with various examples of Fallen script in the background, was previously available in the Bungie Store prior to the game's launch. This shirt was also made available at PAX 2013 where its creator, Bungie graphic designer Elliot Gray, gave a little insight into the story behind its creation to a fan who asked him the meaning of the symbols. He indicated that he had used the names of several of the game's developers for the background, then pointed to one name in the corner and indicated that it translated into "Ondarius", which he stated was the name by which one of the Great Houses referred to themselves, although he didn't elaborate on which House it was. 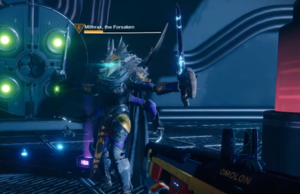 The Fallen's history with the Traveler is very much similar to Humanity's, as the Traveler arrived and brought in a Golden Age for both, only for it to be taken away by the Darkness. However, unlike with the Fallen, the Traveler stayed and defended Humanity when the Darkness arrived. The Fallen are likely a prime example of what Humanity would have become if the Traveler not stayed and created the Ghosts to find and raise the Guardians. Over the course of the Destiny series, from the base game back in 2014 to the present day, more and more Fallen characters have speaking roles, some even speaking English. House of Wolves was the first to have both a speaking Fallen antagonist and ally. Forsaken has the majority of Fallen antagonists speak English and a new ally that speaks English fluently. A Captain belonging to the House of Winter. Another Fallen Captain, displaying the colors of the House of Winter. A Fallen in front of a Fallen Walker. Concept art of a Captain or Kell sitting on a throne holding a Ghost. Fallen dropships over the Old Baikonour. A Fallen Ketch with 2 Fallen Skiffs. Early sketches of a Captain, Vandal, and Dreg. Concept arts of Fallen vehicles. Concept art of Shrapnel Launcher and Shock Pistol. Concept art of Fallen stasis capsule. Fallen Captain, saying "Welcome" in 5 languages, including its own. Inverted image of writing on Fallen T-Shirt available at the Bungie Store. Note the translations show the names of various Bungie employees on the Destiny development team, as well as the name "Ondarius". Example of Fallen writing, demonstrating how certain characters combine. Translation: "THE FA LL EN". Fallen belonging to the House of Devils preparing for battle. Concept art of a Hunter roaming through a Ketch. ↑ Bungie (2015/9/15), Destiny: The Taken King Playstation 4, Activision Blizzard, Fallen S.A.B.E.R. ↑ Do You Speak Bungie?